A comprehensive treatment of carbon-13 NMR spectroscopy, one of the most important methods for the elucidation of the structure of organic molecules. 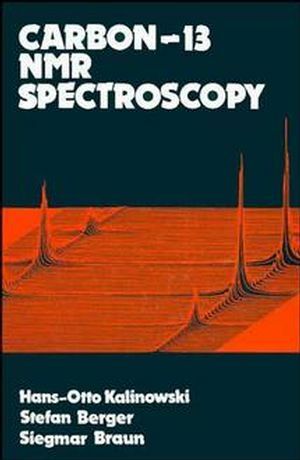 Thoroughly describes all aspects of the experimental method and the pulse Fourier transform technique, as well as the structure dependence of the ?13C-NMR parameters chemical shift, coupling constant, and relaxation. Examines the different classes of organic compounds, including organometallics, and provides a section on coupling constants organized according to the number and kind of intervening bonds. Dynamic phenomena, the application of LSR, and the determination of reaction mechanisms by ?13C-NMR are treated as well. Hans-Otto Kalinowski and Stefan Berger are the authors of Carbon 13 NMR Spectroscopy, published by Wiley. Experimental Techniques of ?13C NMR Spectroscopy. ?13C Spin-Lattice Relaxation and the Nuclear OverhauserEffect. Use of Lanthanide Shift Reagents in ?13C NMR Spectroscopy. ?13C NMR Spectroscopy in the Study of Reaction Mechanisms.